Back once again with some more creations from my 2 Squared School Kit. I told you I was up for the challenge of conquering this kit. Getting closer. 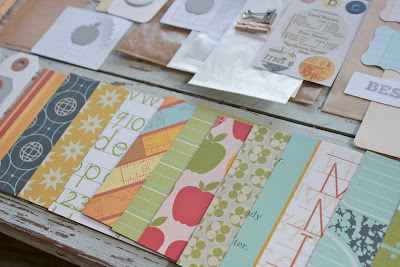 :) Here's another peek at all of the kit contents. There's a LOT of goodies in this kit, especially when you sort it all out and begin creating. 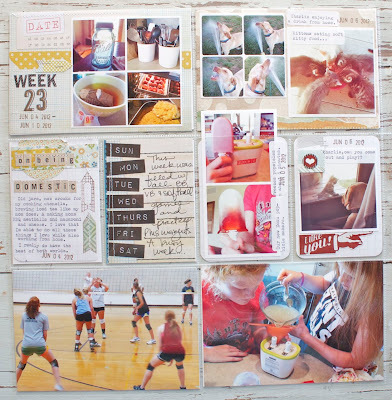 As the kit suggests with the "2 squared" title, there are lots of 4 x 4 papers to start your projects. This is a great way to get a creative lift if you're in a little crafty slump. 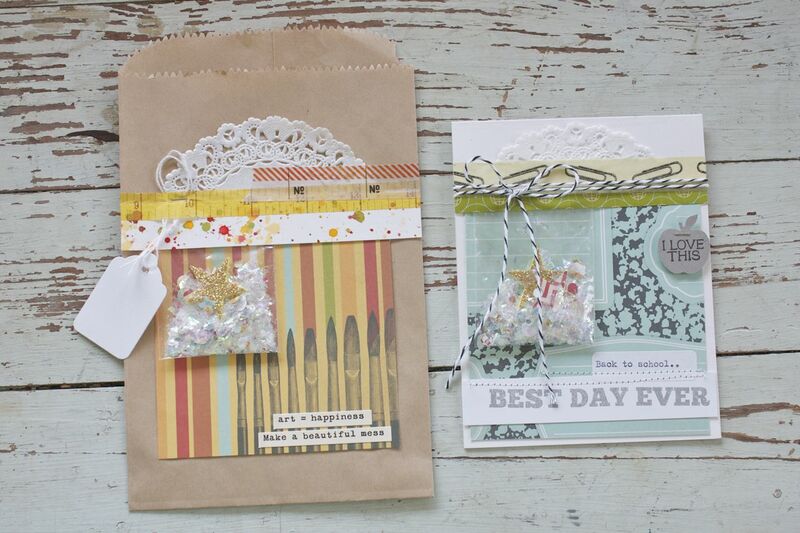 Each time I sat down to create with this kit, I picked a few items and then just went to work. 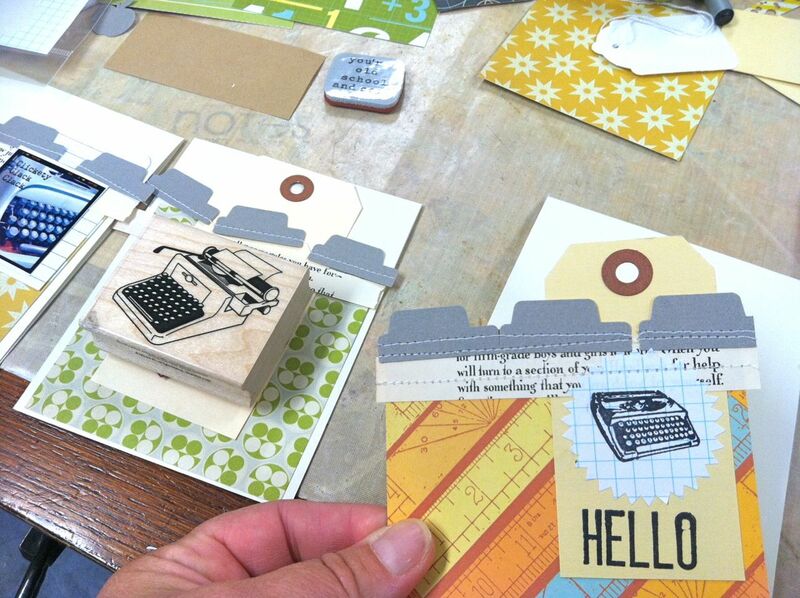 Here I have some notecards with envelopes and stamped pieces. 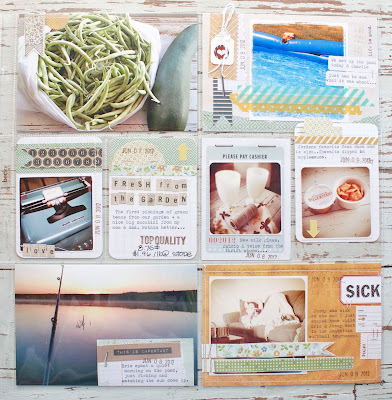 The large stamped bulls eye image is Studio Calico's Plano Stamp. 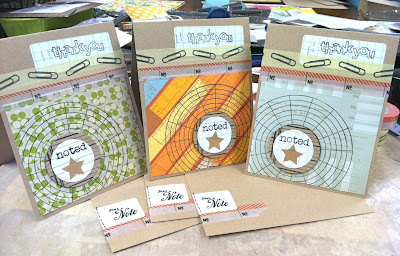 The small circles were stamped with Studio Calico's Take Note. 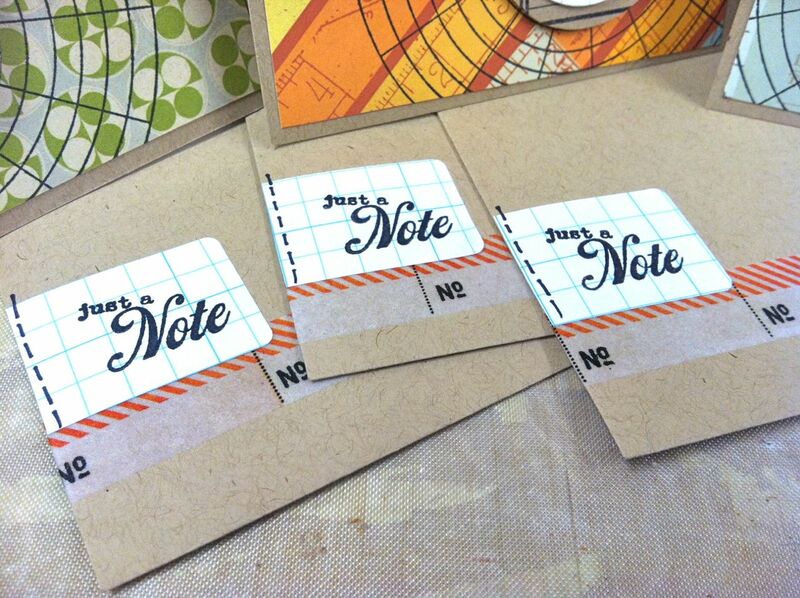 And here's my set of 3 finished notecards. These came together very quickly so they'd make great teacher gifts because they're easy to mass produce. 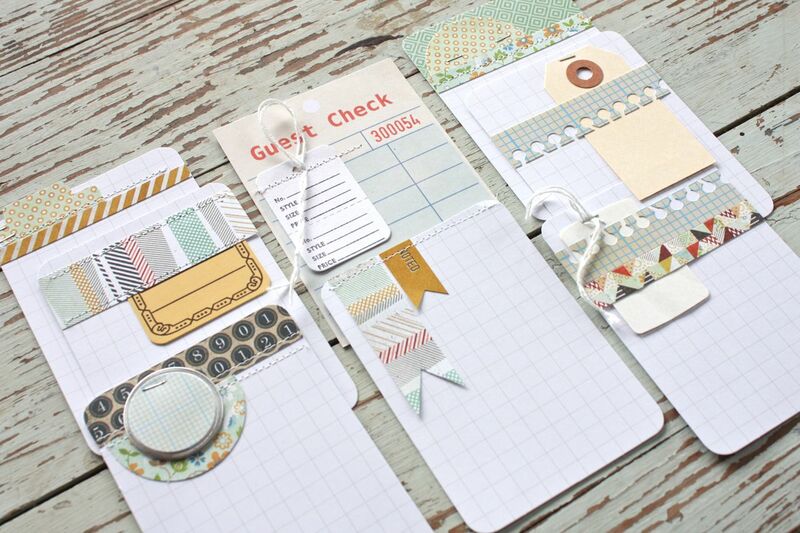 On the tops of my cards I adhered some stamped Grid Paper Labels. I'm loving these labels lately for sentiments. They take ink well and if you want several of the same sentiments you can just stamp them all down the row while the labels are still on the backing sheet. 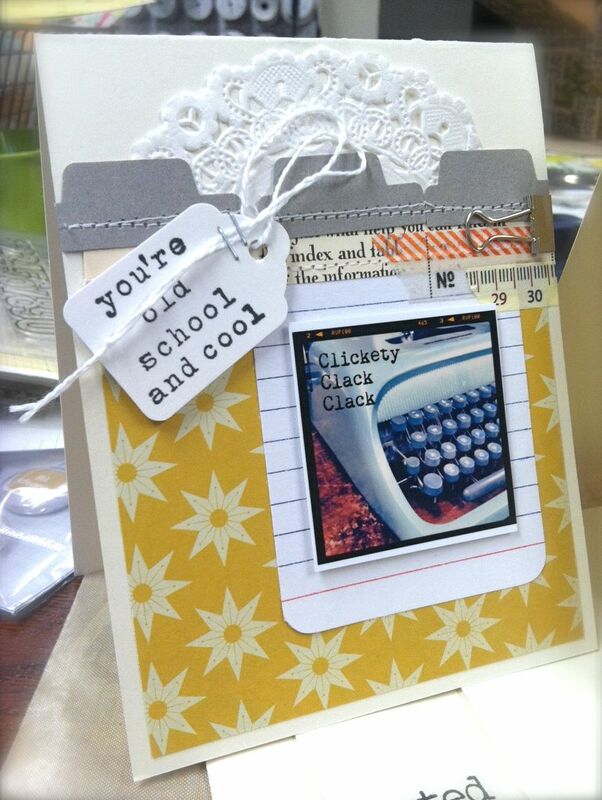 I've also got Notebook Paper Labels. I layered 2 strips of Washi tape over the label. 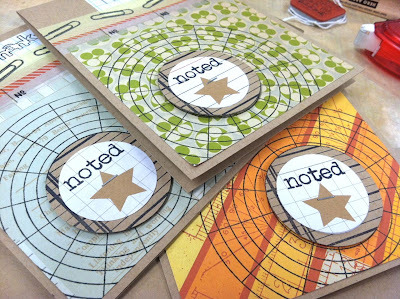 On the bottom of the cards I popped my focal pieces right in the centers of the stamped circles. Realllly love the graphic feel of this. And perfect for the fellas too. 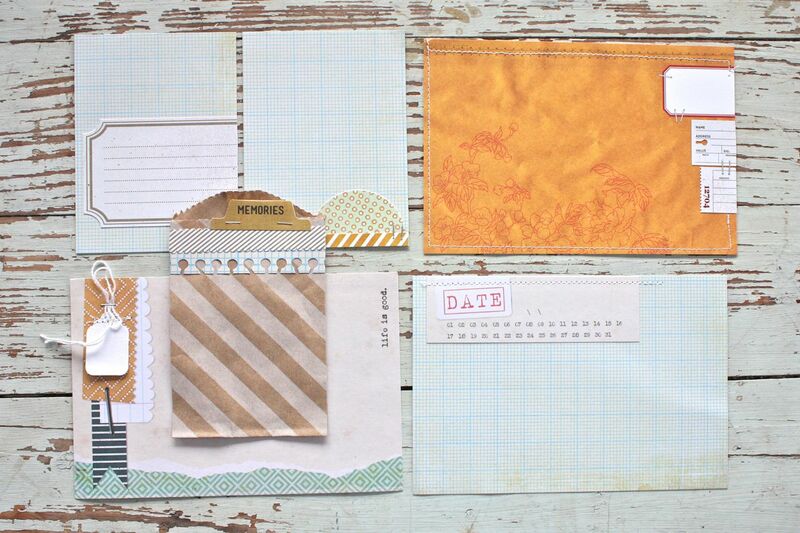 On my Kraft envelopes I used more Washi tape + more stamped Grid Paper Labels. 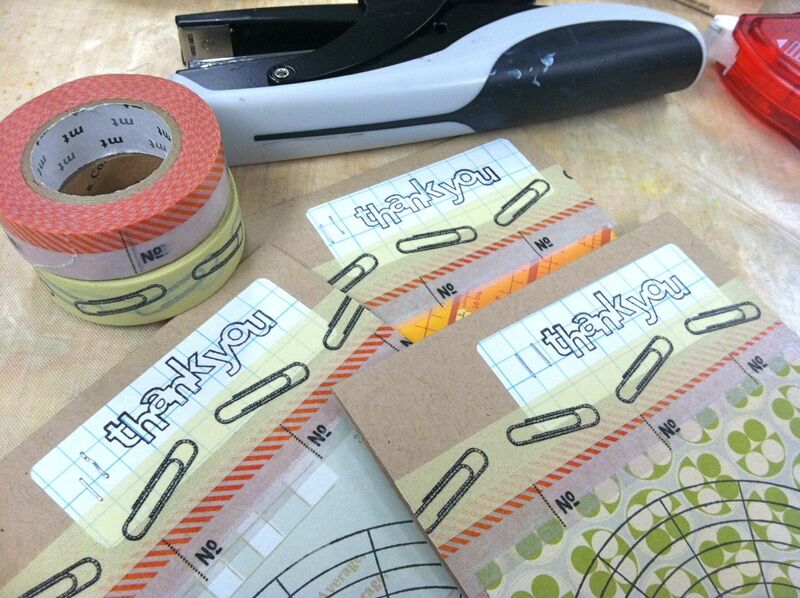 Any of my labels work great on envelopes because they are very flat and stick well. For packaging I used a Waxed Paper Sack from the kit. 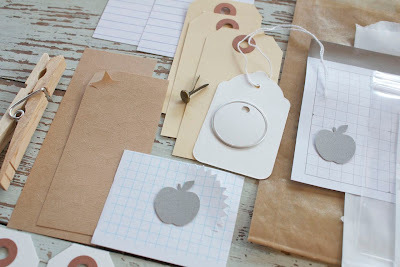 I know I will be keeping a big personal stash of these sacks for teacher treats and packaging up small sets of cards. 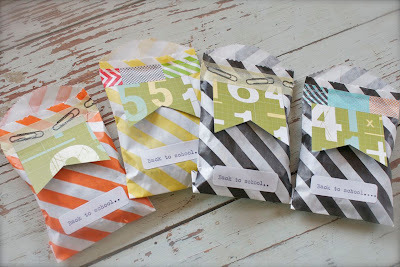 They have a gusset so you can easily fit in a set of cards with envelopes. 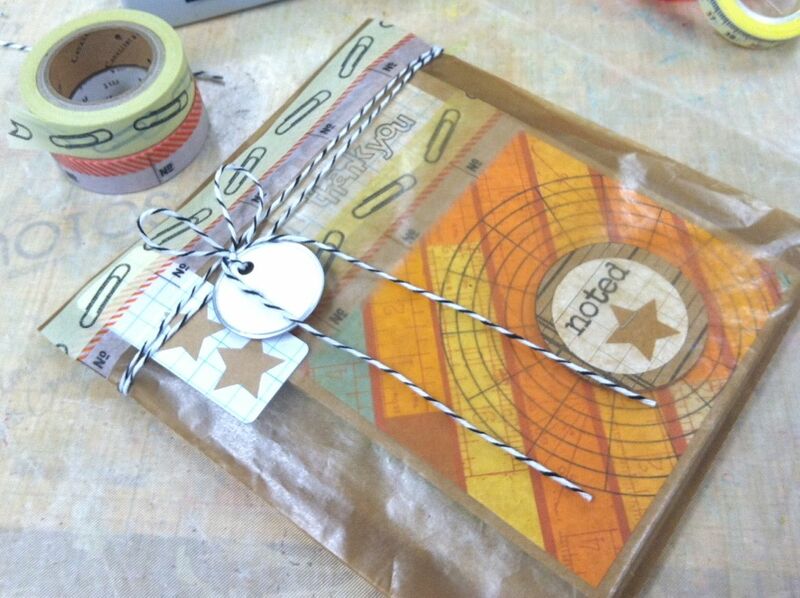 I used yet another Grid Paper Label with some of the Kraft stars from the kit adhered. I sealed up my sack with more Washi tape then added a Metal Rim Tag from the kit with a big loop of black/white baker's twine. Eeek, I just love having a stash of teacher goodies ready to go. Hey everyone. I have a few projects to share with you that I made from my 2 Squared School Kit. I saved a kit for myself and set all of the contents out on a tray. Then I made a list of some school projects I might want to make. A challenge I gave out with this kit is to use it all up so I'm gonna give it a go. 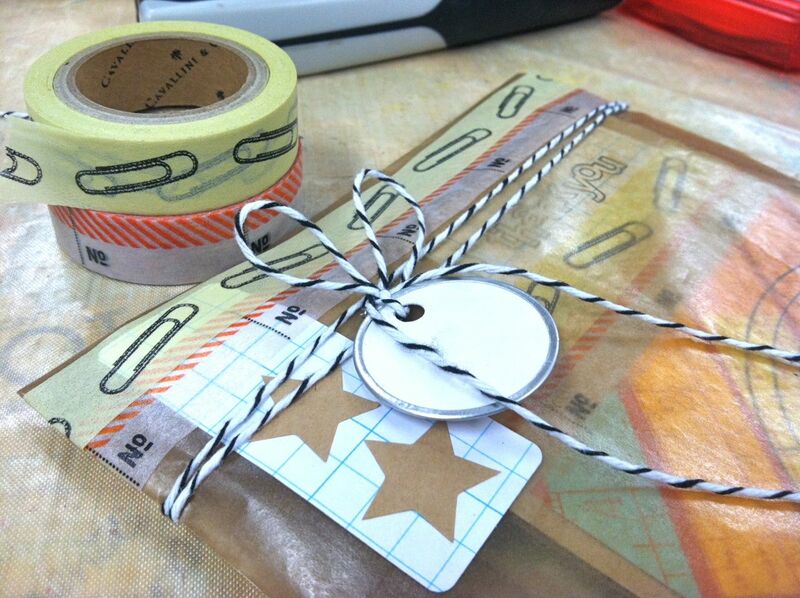 I'm pulling out more of my shop items + a few supplies like twine and Washi tape to use on my projects. First up are some treat sacks for teachers. These took hardly any time at all to make so mass production would be very easy. I pulled one of the 4 x 4 pieces of patterned paper(all from Studio Calico's Elementary line) and cut it into four pieces. 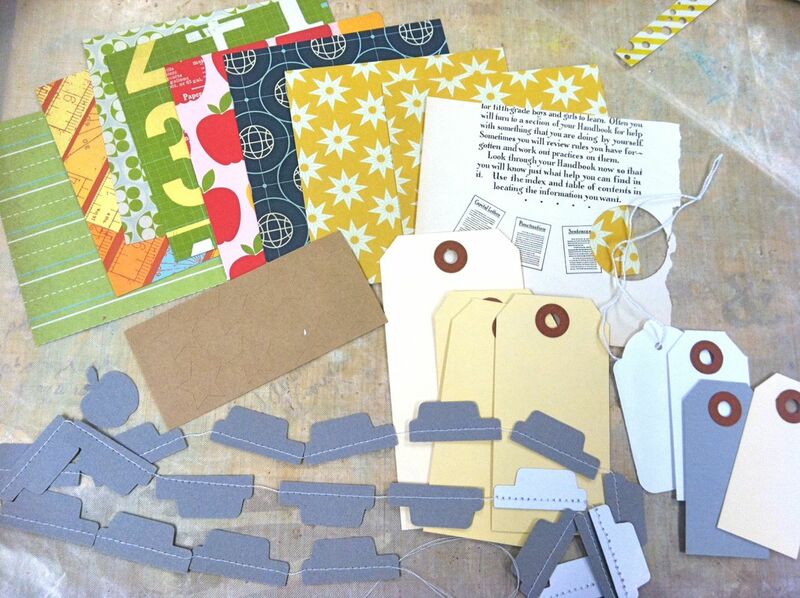 I grabbed some of the striped sacks from this assorted pack + some Washi tape + some Dove candies + some typed labels. I hand cut notches into the four small squares then adhered them to my filled sacks (4 candies per sack) with various Washi tape. I stuck on the labels then finished up the sacks with machine stitching. Perfect little teacher treats. Next up I wanted to use some of the sacks in the kit to make some confetti bags. 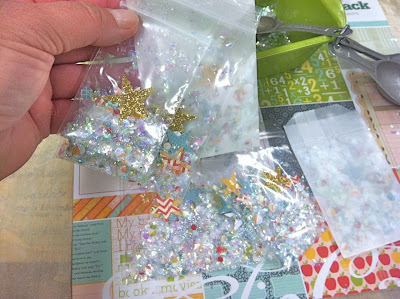 In the kit there is a small glassine sack + a clear zipper sack + I used some smaller sacks from my Sack Assortment for Confetti. 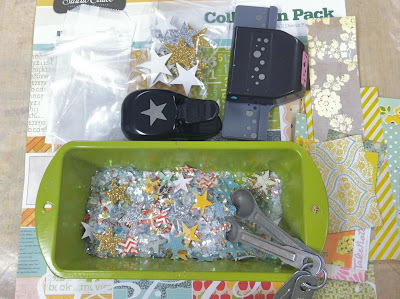 Using scrap paper, my confetti punch and my star punch, I went to work making confetti. To add some bulk I like to add Christmas snow filler + I found a few foam glitter stars to add in. I just kept filling sacks so I could have plenty on hand. These will be fun to have on hand for future use. 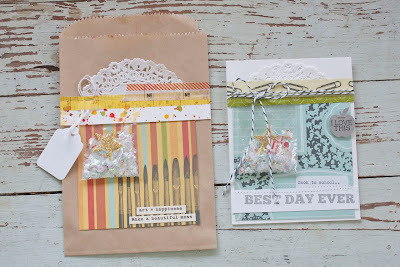 Here are my creations using some of the confetti sacks + some additional items from the kit. 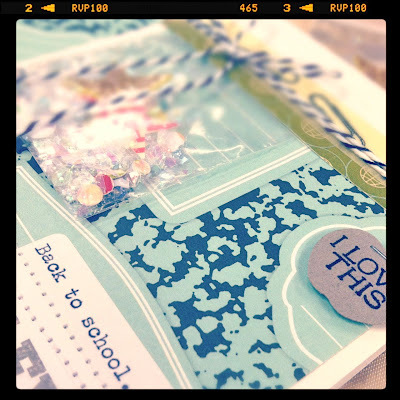 I made a treat/card sack and a back to school card. The sack uses a Large Kraft Sack, a piece of the 4 x 4 patterned paper and a Large White Tag from the kit. 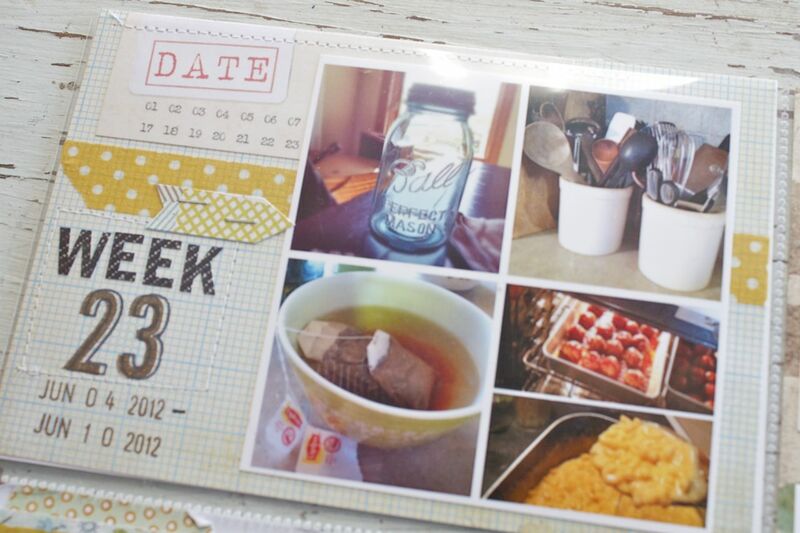 I also used a Dainty Doily, Washi tape, a piece of splattered cardstock + some word stickers and mini staples. I think I will use this sack to hold a treat or set of cards for the girls' art teacher. She is so awesome. Finally for today's projects I made some bookmarks for my friend, the school librarian. From the kit I used a piece of 4 x 4 patterned paper cut in half, the 2 library cards, the blue label and one of the sticker selections from Studio Calico. I also dug a few pieces of the punched strips I used to make confetti from my trash can. To hold the bookmarks I used a Medium Glassine Sack, a Small White Parcel Tag and a strip of the old book paper from the kit. 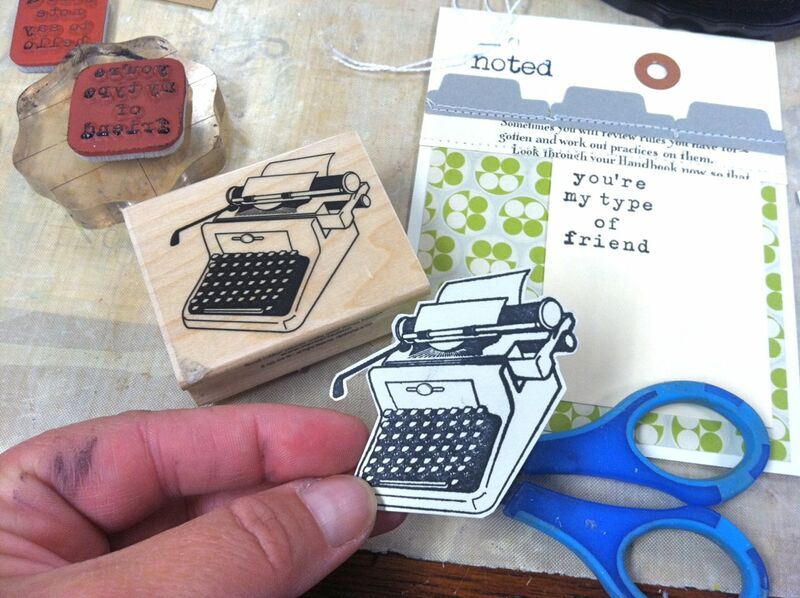 I typed on the white tag with my old typewriter then tied it around the sack with baker's twine. 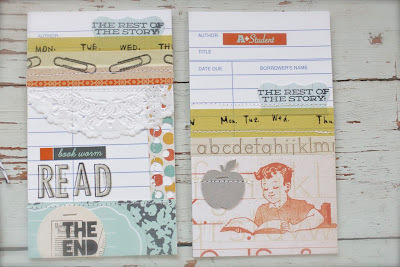 For the bookmarks I layered them with patterned papers, Washi tape, 2 halves of the labels which I stamped with Studio Calico stamps, a punched apple, stickers from the kit, a punched circle from the old book paper + a snippet of a Dainty Doily. 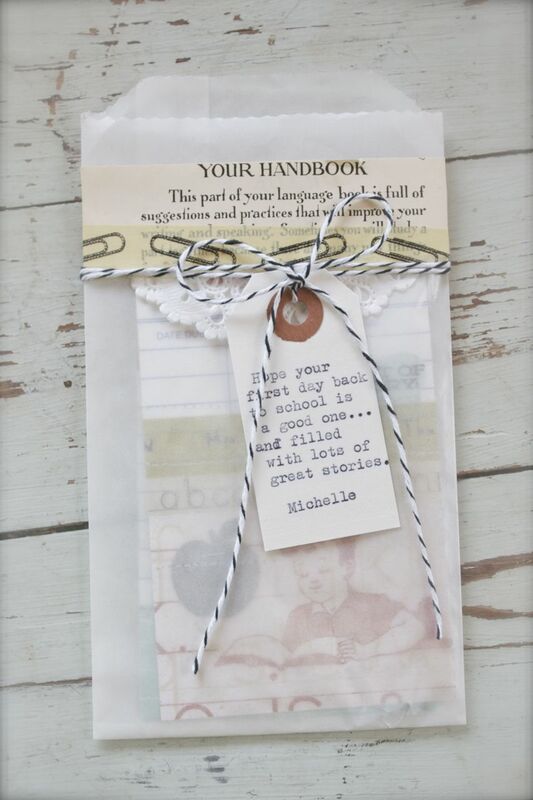 For this bookmark I stamped the word "READ" using Studio Calico's Stepping Stone Alphabet, first in the black outline and then in the solid grey. 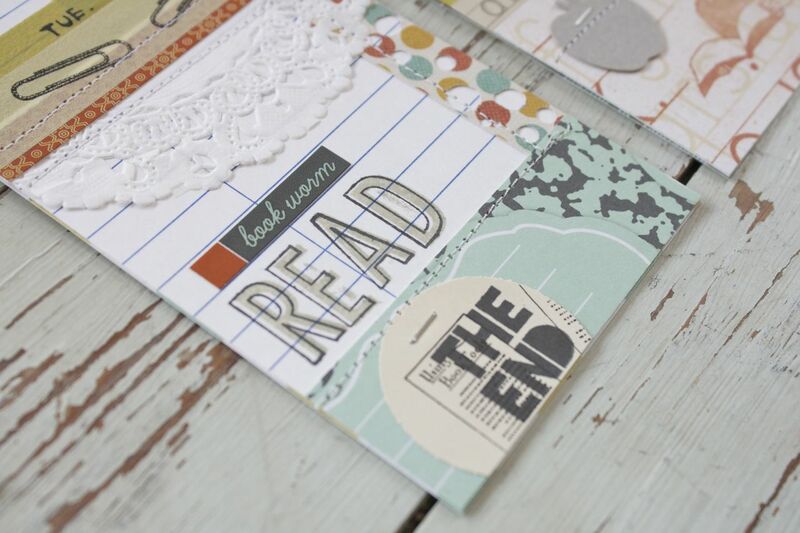 "The End" was stamped from this Studio Calico stamp set. 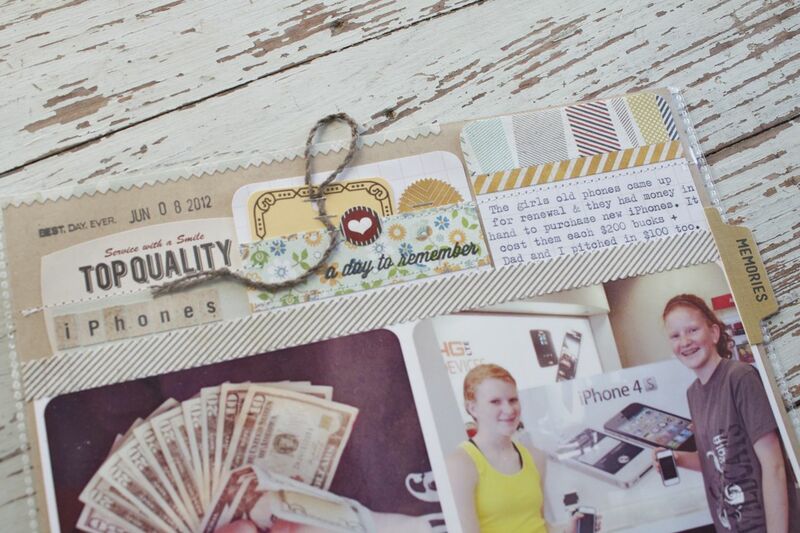 Machine stitching keeps all the paper layers in place. You can see more of my bookmark creations at this link. The back side of one of the papers has this adorable little boy reading a book. 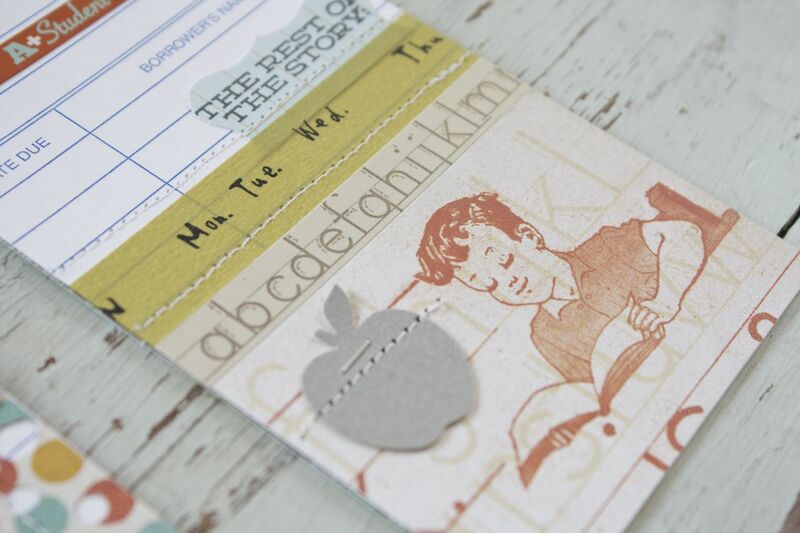 Since my librarian friend splits her time between the high and grade school, I thought this sweet bookmark would be fun to use for the books she reads to the little ones. I finished this one off with days of the week Washi tape, a sticker strip from the kit and then I stitched and stapled over the punched apple. Since I add a lot of stitching I like to adhere a piece of cardstock on the back of the library card so the bookmarks finish up nice and clean. I had so much just creating and having fun. Next up I'll be making up some cards to give as little sets to the teachers. They love to get a little surprise now and then with a few chocolates thrown in. Stay tuned. 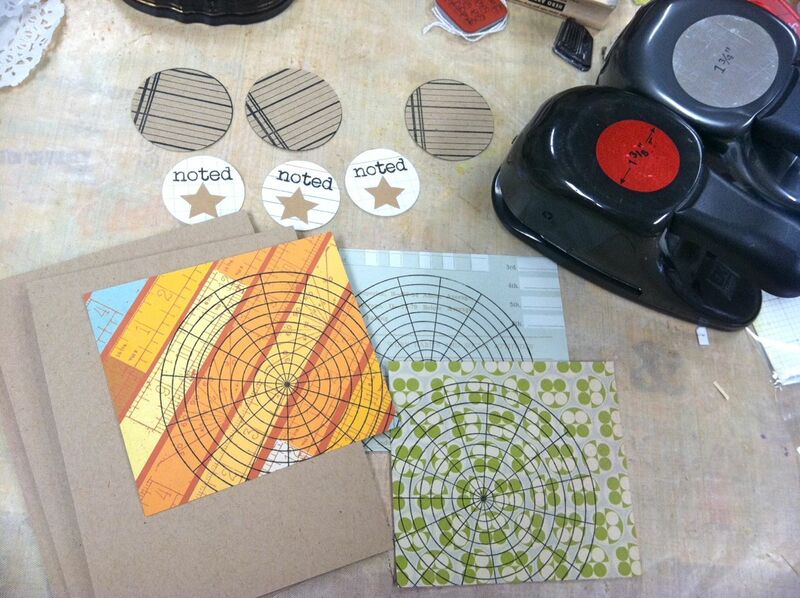 There are still some of the 2 Squared School Kits left in the shop. The first batch of kits went out this morning so if you ordered, be looking for your kit + other ordered items the first of next week. 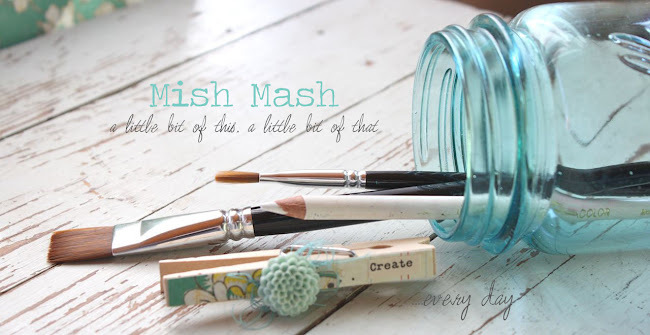 What kind of fun projects are you thinking of making with the kit, I'd love to hear? I'm back today with Week 23 of my Project Life. This week I am a guest at Basic Grey and will be using the Clippings collection of products on my pages. 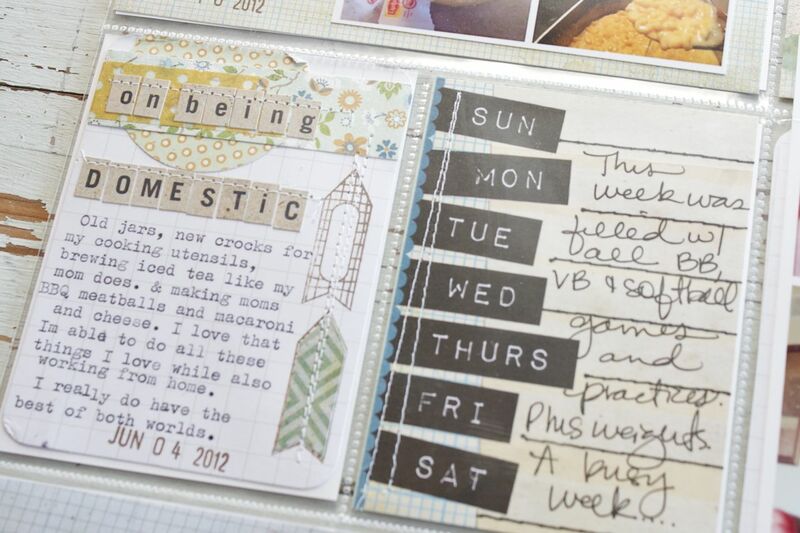 Melanie Bauer from Basic Grey will also be using the same products for a week of her Project Life. 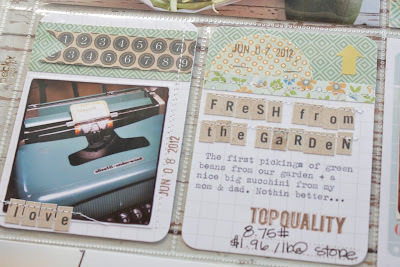 I was thrilled when Mel asked me to use the Clippings line because I love it! It's graphic, a little vintage, has a great neutral color way and there are oodles of fun embellishments within this line. 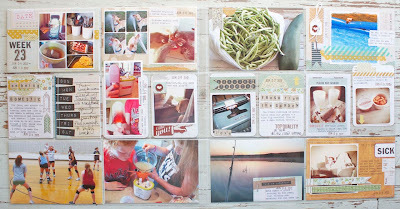 For me, the best way to use a large variety of products from one line is to grab some blank Project Life journaling cards and just start creating my own handmade inserts. 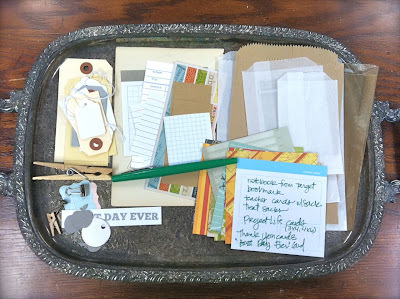 I made way more than I needed for one week but the leftovers will go into my stash to use for future PL pages. Please zoom in to get a better look. 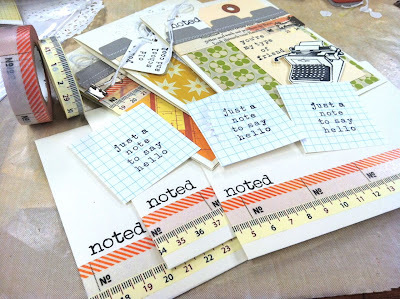 I used just a few tags from my shop + a few punches and the rest of the items are from the Clippings collection. Here are a few of my favorites. 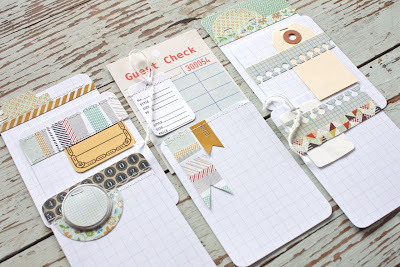 I love the "guest check" journaling card from the Snippets pad, the notebook fringe stickers from the 12 x 12 Element Stickers sheet and the great patterns in this line. When it becomes available again I'll be purchasing the Garland also. It's die cut and stitched together, ready to use. Cool idea. 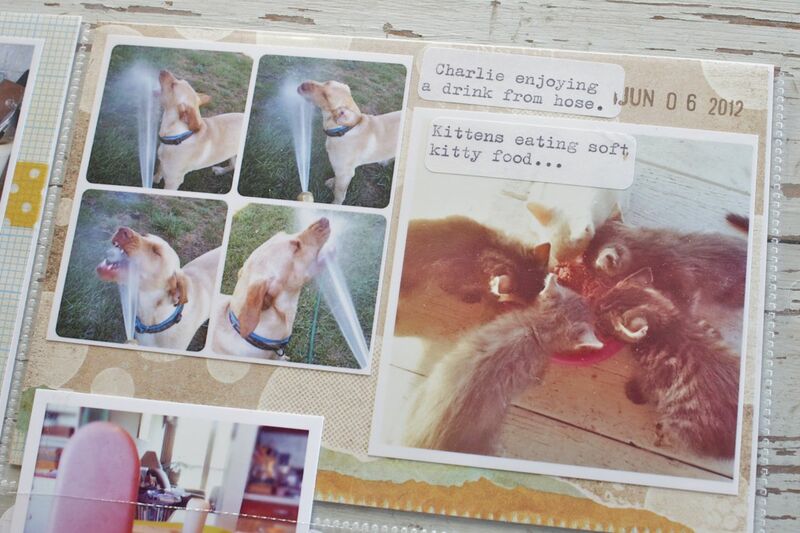 From the Snippets booklet I also made these 4 x 6 inserts. I used just a few items from my stash to fancy them up a bit. 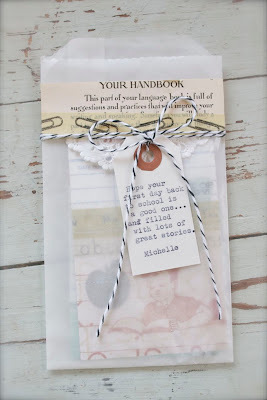 I also embellished a paper sack to hold some journaling or tags. And now for my finished pages. 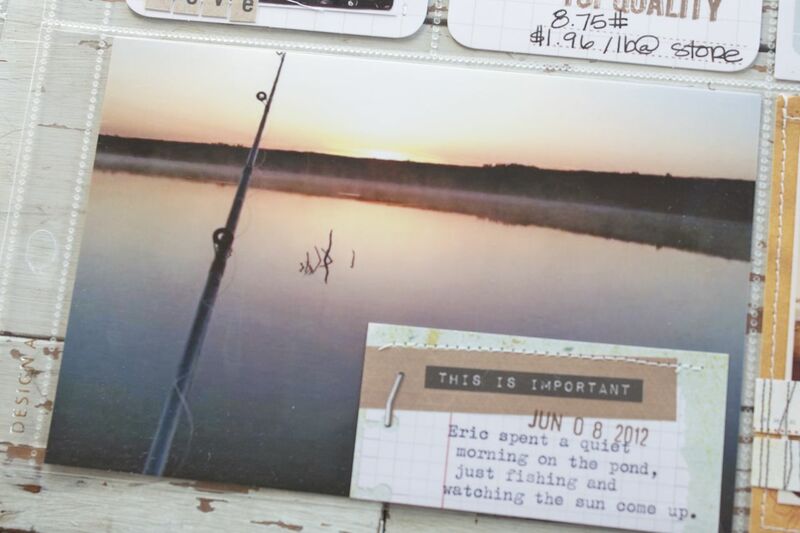 Here's how I use my handmade journaling cards: once my photos are trimmed and placed on top of the page protectors I go through my journaling cards and just start selecting ones that seem to fit in terms of color, photo placement, etc. 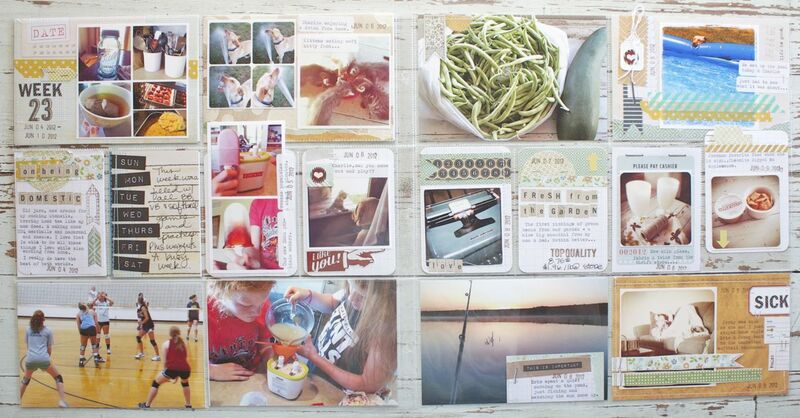 A layout comes together really quickly this way, especially since I had 4 x 6 inserts made ahead of time also. 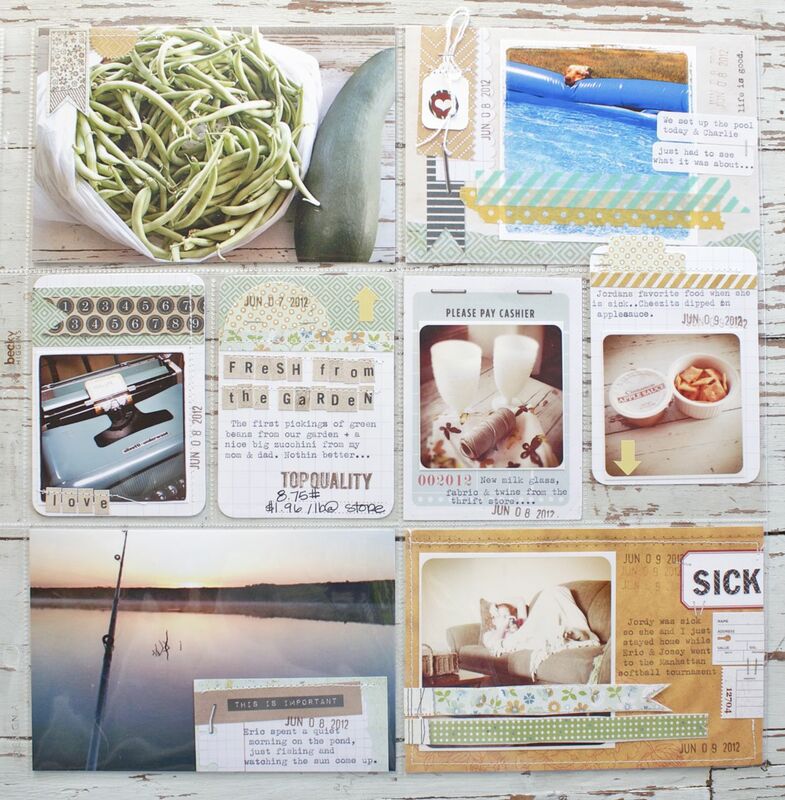 This dated 4 x 6 inserts was embellished with a photo collage, a snippet of Washi tape, an arrow sticker from BG, Studio Calico number stamps and letters from the 12 x 12 Alphabet Stickers. Our pets. 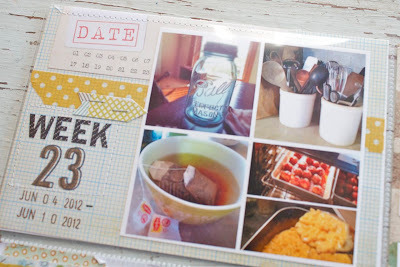 Another 4 x 6 BG insert simply embellished with typed label stickers + a date stamp. Curious Charlie discovered what the pool is all about. 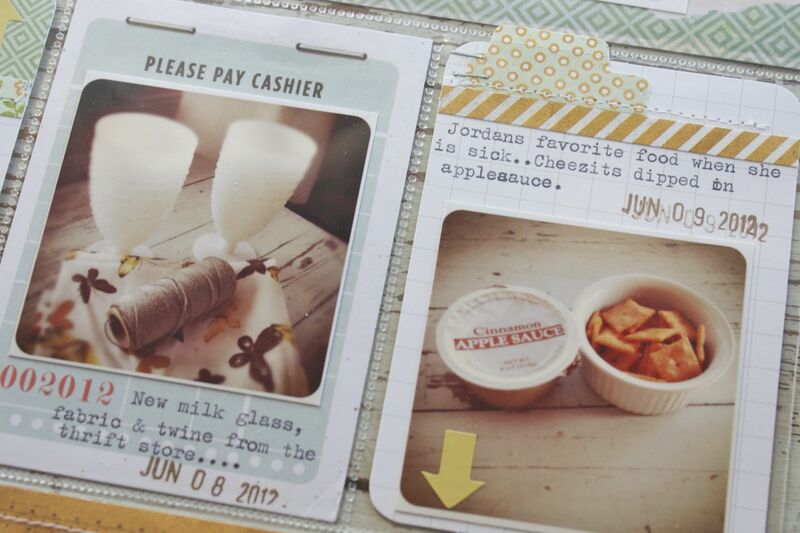 I loved the layered look of this 4 x 6 BG insert. 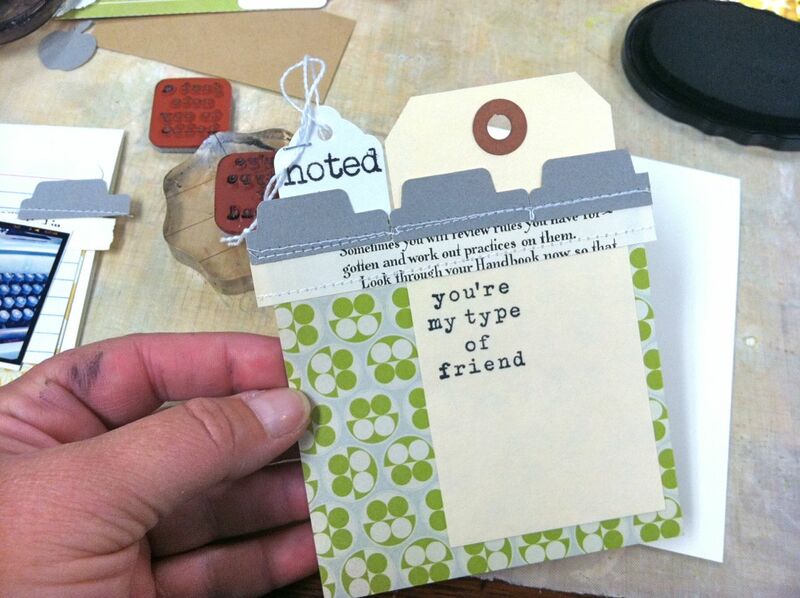 I added a small tag with circle heart sticker + Washi + my typed labels. I love the layered look without all the bulk. Eric had a nice day of early morning fishing at the big pond. I typed on a trimmed down BG journaling card from the Snippets pad. Here's another 4 x 6 insert straight from the Snippets booklet. 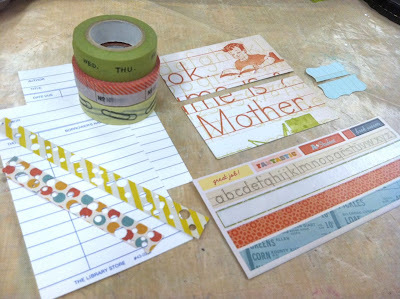 I added more of the BG letter stickers, some tickets from the Elements Stickers and then hand cute a few long strips from a piece of patterned paper from the 6 x 6 paper pad. Here's the 12 x 12 version of this paper so you can see the fun strips. Moving on to the 3 x 4 inserts. 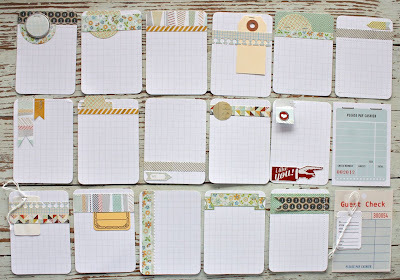 On the left insert I used one of my handmade journaling cards along with more stickers from the 12 x 12 Alphabet Stickers + some arrow stamps from the coordinating Hero Arts set. 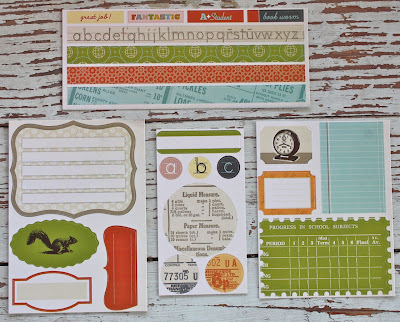 Here's the other stamp set, also great for PL. On the right I have a Week in Review card. All I had to do was add in a little of my own handwriting. 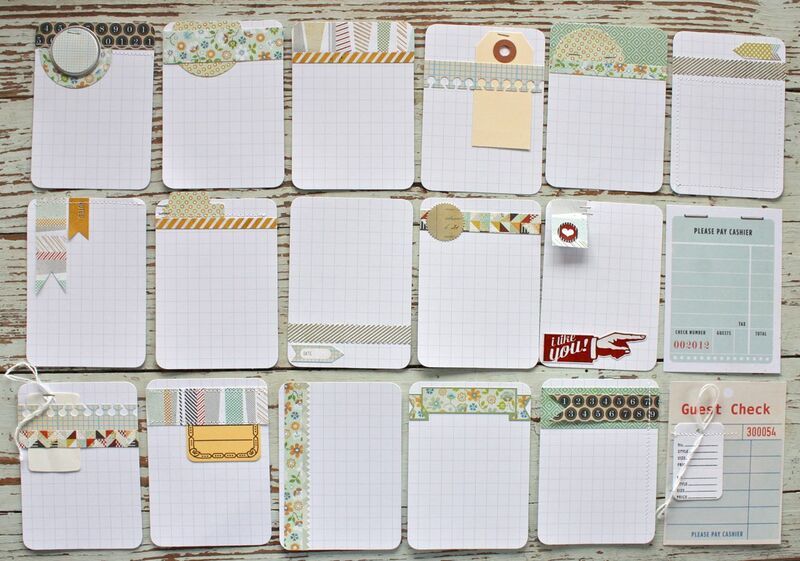 More inserts embellished with my typed labels + some stickers from the12 x 12 Elements Sheet. Here I used a some hand cutting and a little help from punches to embellish my 3 x 4 inserts. 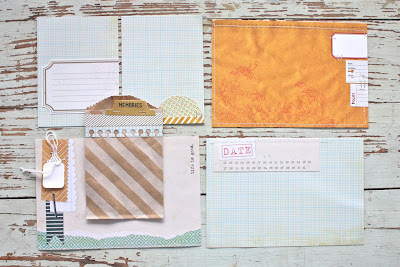 I loved using the small BG letter stickers with stitching over the top. They make fun mini titles for my 3 x 4 cards. On the left is a page from the Snippets booklet. 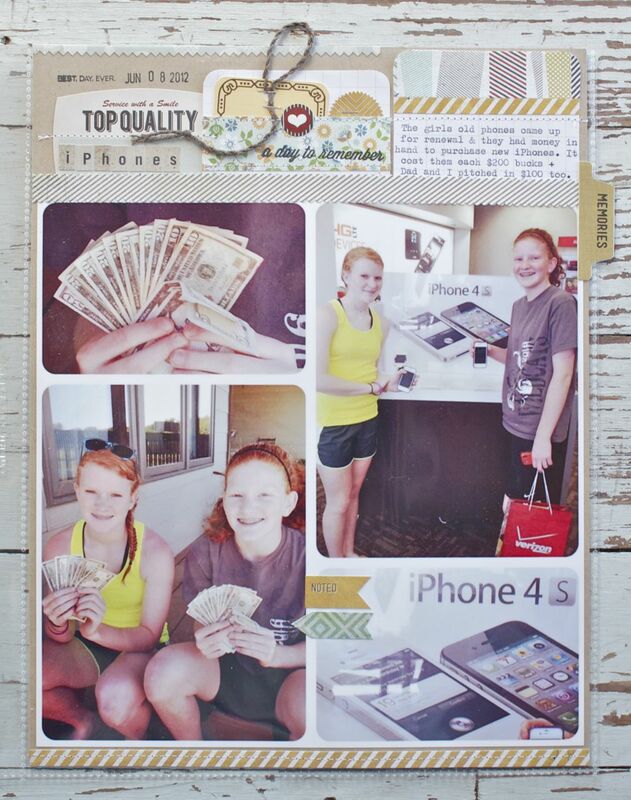 I only added my photo and typed journaling. So easy. On the right I used a tab punch + a border sticker from the 12 x 12 Elements Stickers. I also created an 8.5 x 11 traditional scrapbook page insert for this week also. It was a big day when the girls got their new iPhone 4's. I printed a giant 8 x 8 size Instagram print which filled most of the page. 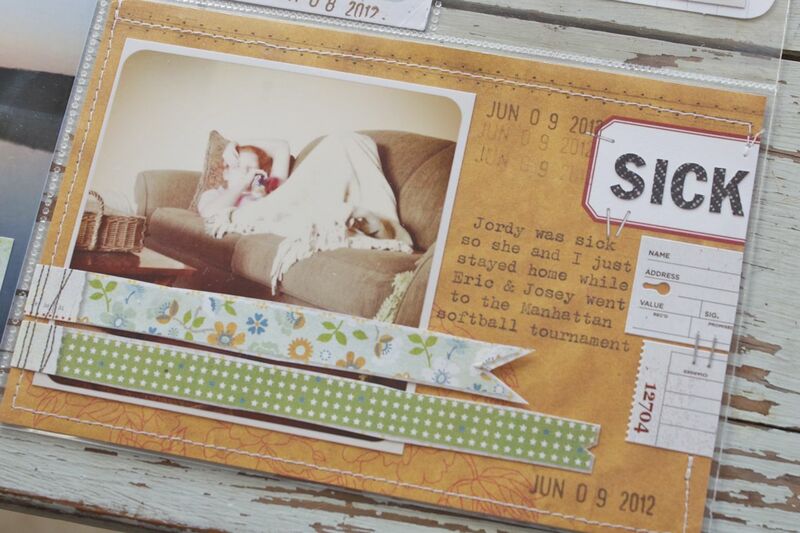 For my inserts I like to print larger photos so that an event is really highlighted and made special. For what was left to embellish, I used 2 of my handmade journaling cards. I just tucked them under my photo after adding some stamping and typed journaling. The fun yellow tag is a Printed Hang Tag from my shop. On the left I embellished a sticker from the 12 x 12 ElementStickers sheet with some small BG sticker letters and tucked it under the photo also. 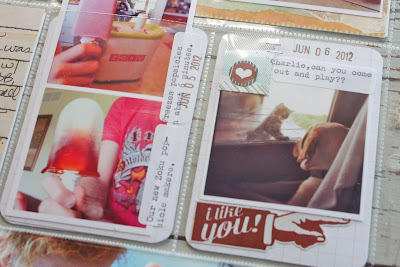 I added a border sticker along the top of the photo and as a finishing touch I added the memories tab from the sticker sheet to the outside of my page protector. And that's it for this week of Project Life. I'd like to thank Melanie for asking me to be a guest this week for Basic Grey. 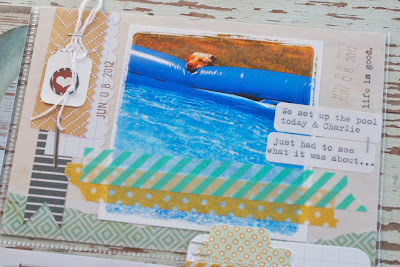 This was definitely a fun week for me to work on and the Clippings product line is so awesome. 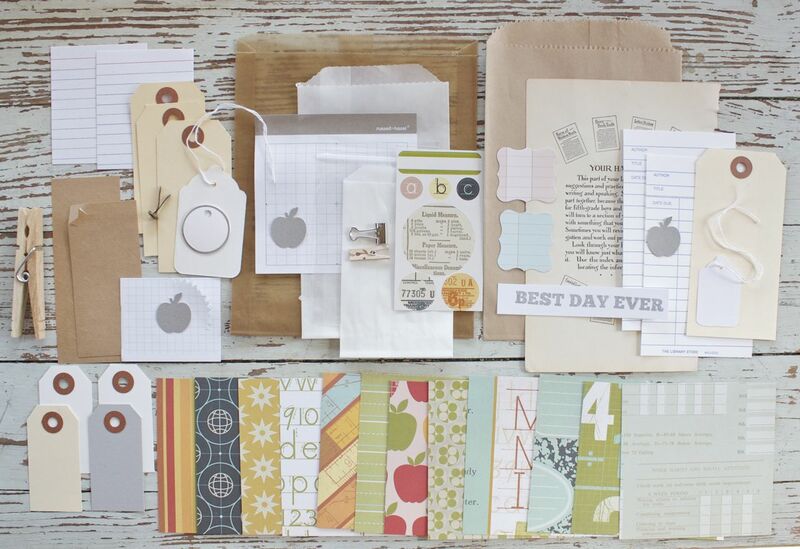 Edited: Forgot to add that I'll be doing a prize drawing for the Basic Grey 6 x6 Paper pad, the alphabet stickers, the elements stickers the snippets booklet and one of the stamp sets. Wowzers! 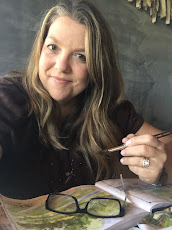 Just leave a comment on this post telling me a little bit about how your Project Life is going. I will close the comments on Sunday evening at 8pm Central Time. You can read all about them here at Becky's blog. Don't hesitate if you want something. :) I can't wait to use some of these new items. Hey everyone. After reading the comments from my last post, it seems you're all excited to see more cards coming back to the blog. 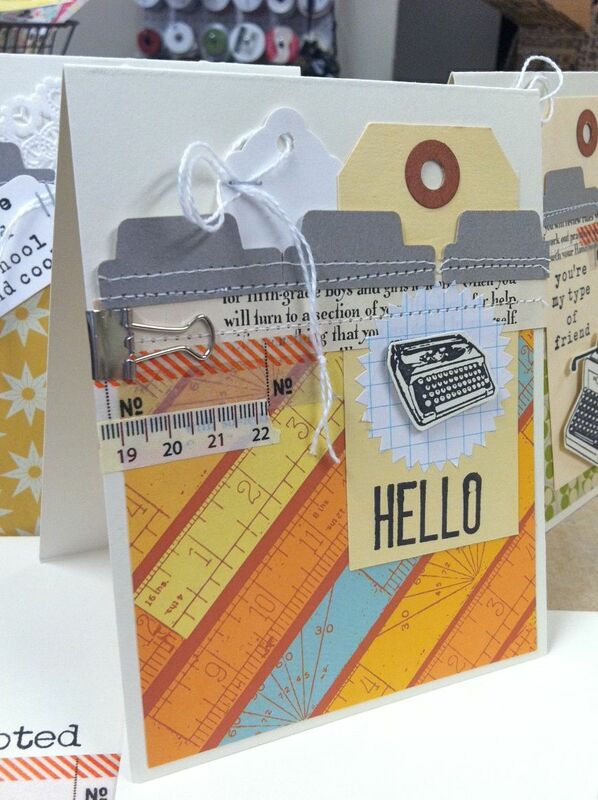 Be sure to stay tuned because I've got some great new things coming for all you card lovers. I'll still be posting Project Life pages, packaging and all my little adventures along the way too. 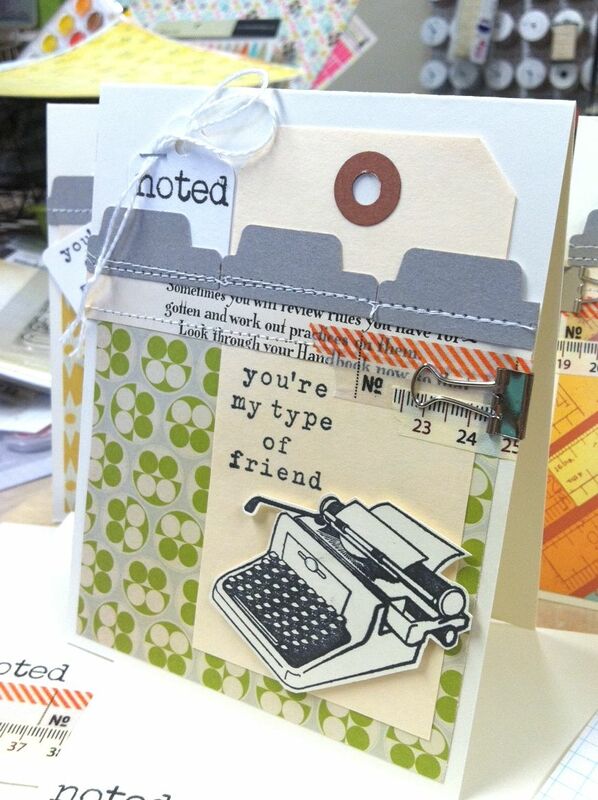 For all you card lovers, you'll be seeing lots more kits in my shop that involve card making. Today I'm kicking it off with my 2 Squared School Kit. 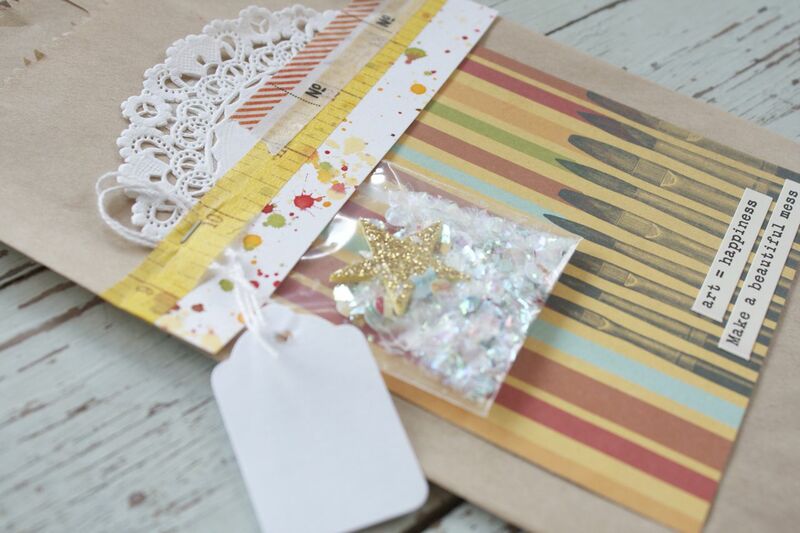 This fun kit comes with a challenge too: try to use all the items in the kit to create back to school cards, teacher thank you cards, bookmarks, treat packaging, notebooks and more. 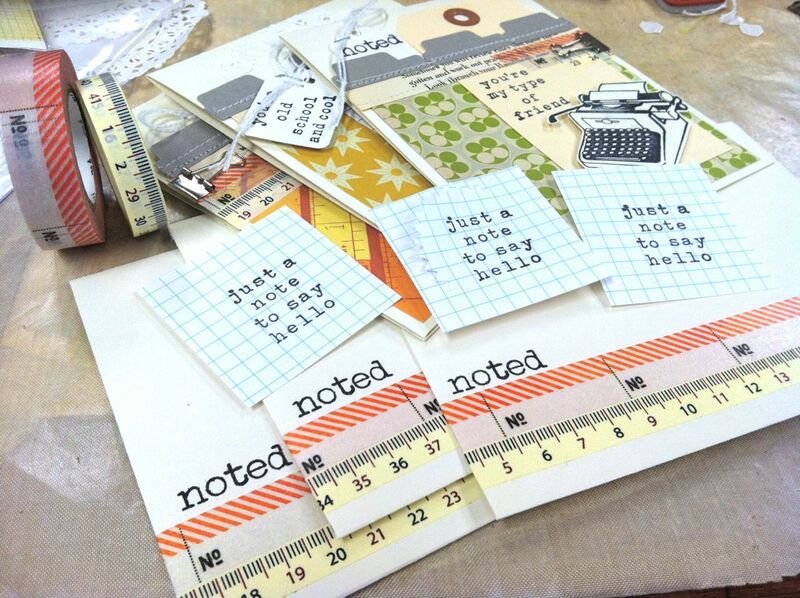 You'll get (12) 4 x 4 Studio Calico patterned papers to get you started. 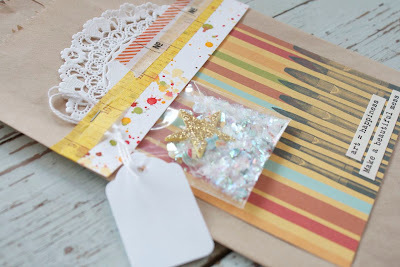 Other elements of the kit include tags, star and starburst circle stickers, sacks, vintage school book page, library cards, clips, Studio Calico stickers and more. 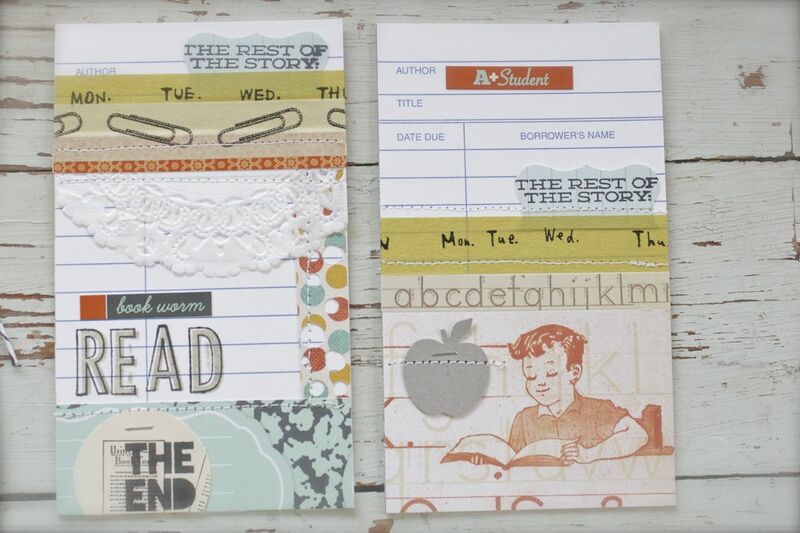 My point of that rambling above was that the 4 x 4 papers you'll get in the kit are school themed but very cool looking. 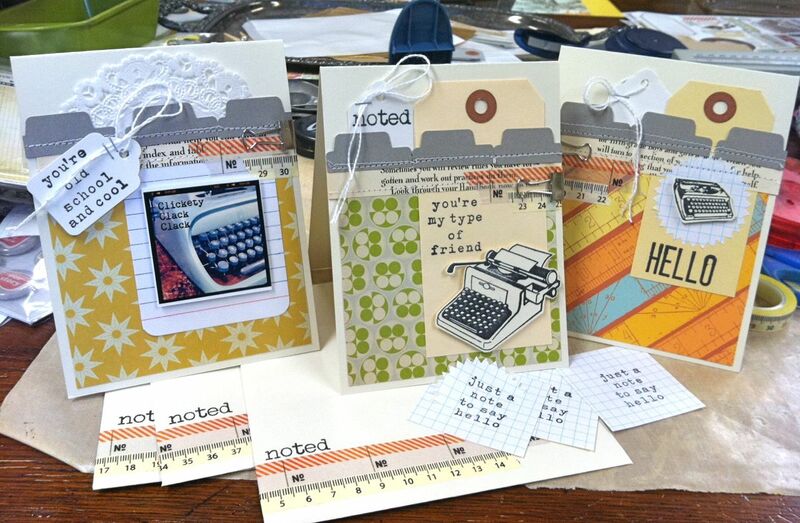 They definitely will work for my high school teacher creations as well as for the younger grades. And again, my challenge...or should I say assignment..... is for you to start with these 4 x 4 papers and see what you can come up with. I'm planning on taking a kit for myself, grabbing a few other items from my stash.....and then I'm going to see how much I can make from this one kit. Let's see if we can conquer the kit! 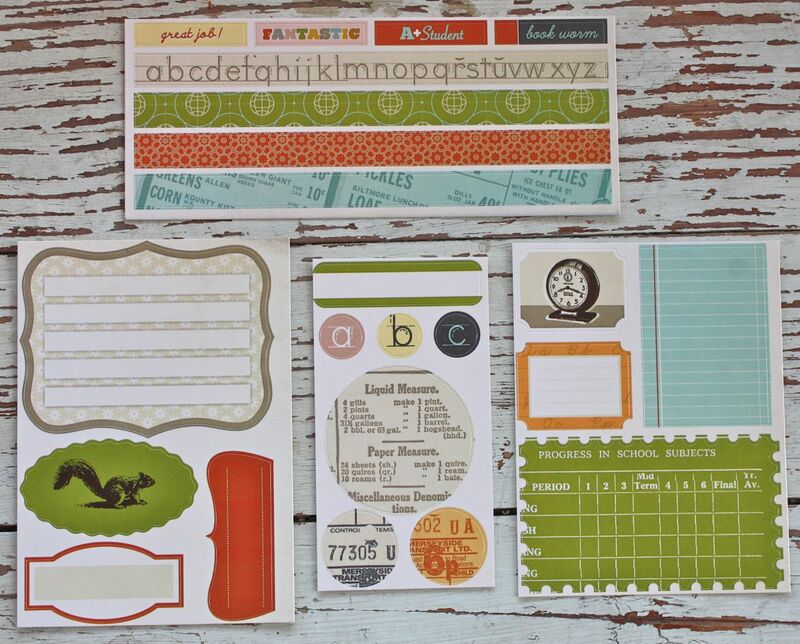 Each kit will also come with one of these four Studio Calico sticker selections too. There's lot of other goodies to add to your projects too. I know I'll definitely be making more bookmarks from the library cards. 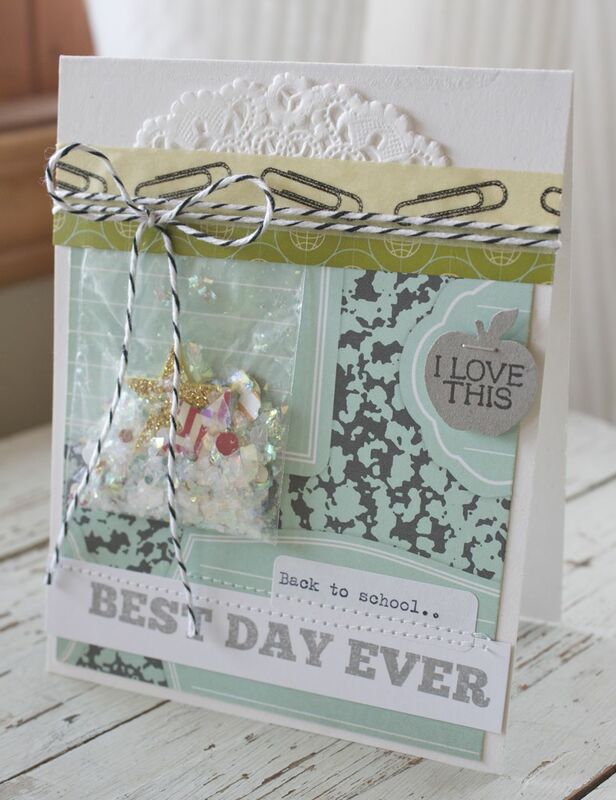 And that "best day ever" stamped image must go on a first day of school card. The teachers always get a laugh over that one. In the kit you'll also get some punched apples, an old fashioned brad, a clothespin to embellish to keep track of school papers perhaps and some Kraft star stickers + a gird paper star sticker. We all loved getting our papers back with a star on it, right? I got this little card in a recent order from Studio Calico. 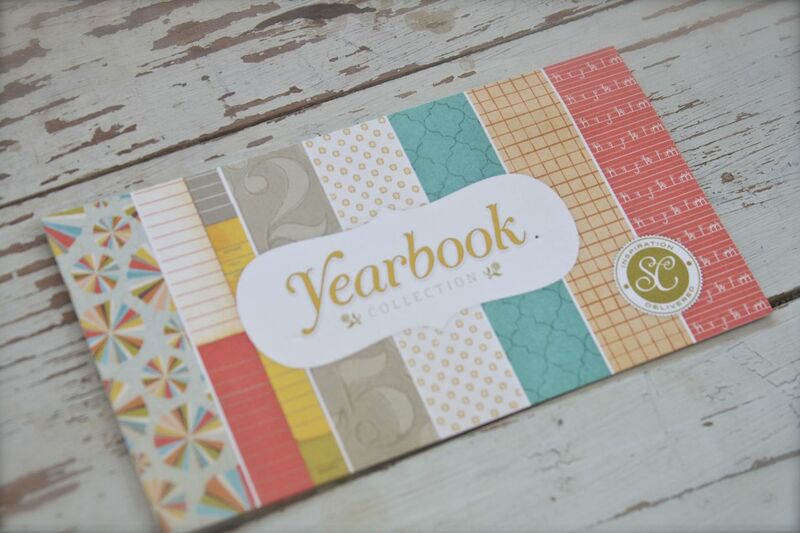 It shows some sample papers from the new Yearbook line coming out. 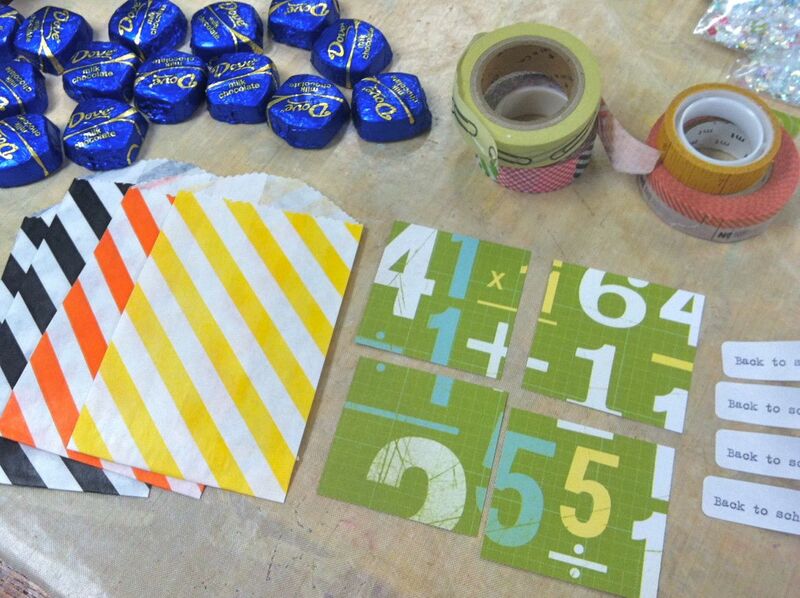 Coordinates perfectly with my 2 Squared School Kit if you want to hold on to a few items. I just got my mail and received my package from 2Peas. I MUST, must, must show you the new My Mind's Eye products I got. Sooooo pretty in real life. I can't wait to dive in. 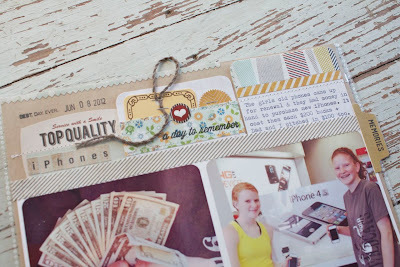 Come back tomorrow for a fun Project Life post. 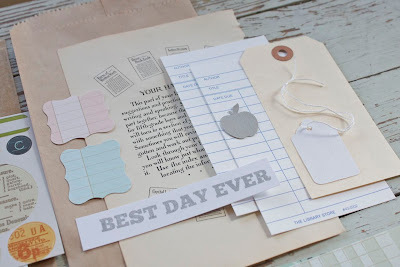 I'll be using a fabulous new line of goodies and will be guest blogging for......? Remember how I said it was hot and dry here? Well it rained. But only enough to wet the ground. So now it's going to be dry again but with HIGH humidity. It's a real drought and the farmers are losing crops, the ponds are drying up so the cattle have no water, fires are breaking out everywhere. It's a mess. Pray for rain! Just thought I would let you know some additional shop items that I've pulled to use. 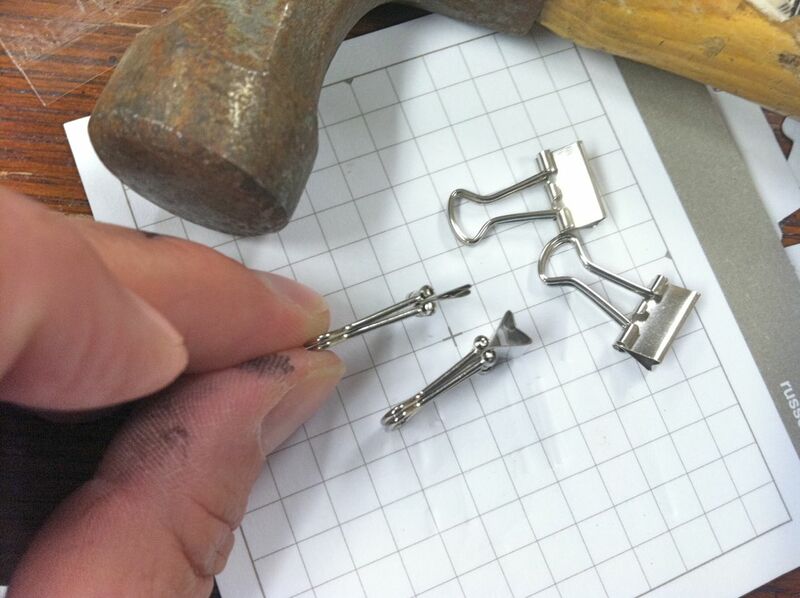 These items will be making their way onto many of my finished projects.